"August 2017 - Nicaragua Carlos Lopez Espresso"
We were last in the presence of the great Carlos Lopez in Nicaragua in March when we awarded him a certificate of excellence for producing consistently outstanding specialty-grade coffee. 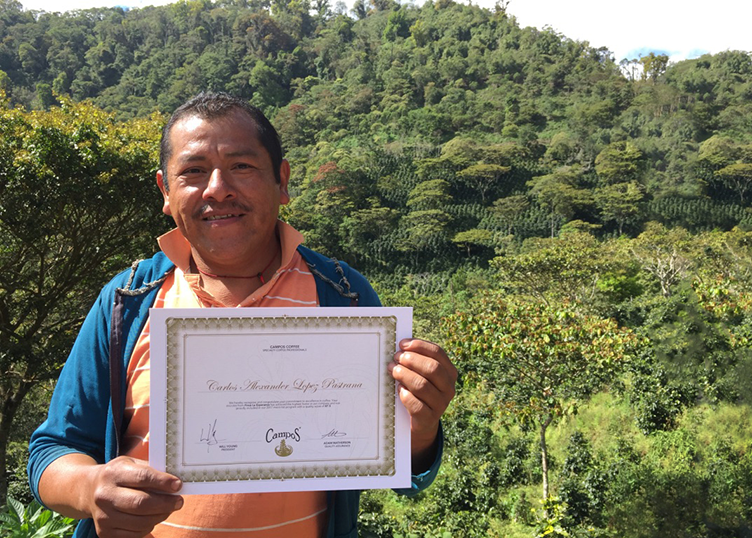 Carlos is one of Campos Coffee’s Top 10 producers for 2017 and our Number 1 producer in Nicaragua. The La Esperanza farm is located in the hills of northern Nicaragua in the Neuva Segovia region and from the farm you can see over into Honduras. La Esperanza is the highest altitude farm in Nicaragua and is very remote. A visit involves a three hour drive on treacherous terrain, followed by a 45 minute walk into the farm. As you arrive, you are warmly greeted by the Lopez family, their dog and a rustic, well-organised processing facility producing amazing quality Speciality coffee. The family has farmed coffee for over 60 years, and successive generations have developed a proactive approach to farming and are heavily involved with Zamora University of Honduras who analyse farm soil and foliage ensuring optimal conditions for specialty coffee cultivation. Nicaragua’s coffee production has been low in recent years, so nding a gem like Carlos Lopez in the remote hills of Nicaragua is a real testament to the dedication our team has in sourcing the best quality, ethically and sustainably-produced coffee on the planet. Dave Withers, Master Distiller at Archie Rose, joined us for a tasting of the Nicaragua Carlos Lopez, our coffee of the month for August. Dave is the leader of the production team and the driving force behind Archie Rose’s spirits vision. We love everything about Archie Rose, who have received multiple awards for their spirits from around the globe! Dave explained how being sustainably minded plays an important role within the ethos of Archie Rose; something that Campos Coffee echoes. Similary, Carlos Lopez who produces our Nicaragua coffee of the month, is constantly exploring new technologies and methods to ensure his farm is run as sustainably as possible.